Date January 17, 2016 . Copyright is a property right, regulated by statute (the Copyright and Related Rights Act 2000) which gives the owner of a creative work (e.g.) a song or a piece of music) the right to permit or prevent the use of that work by others. Copyright confers on the creator of a work the right to allow or prevent a number of ‘restricted acts’. These restricted acts include making a copy of the work, making the work available to the public and making an adaptation of the work. Intellectual property refers to all intangible property such as copyrights or patents. Place the tape, CD, sheet music or the lyrics of the song/work in an envelope. Address the envelope to yourself and write the name of the song/work on the outside. Post the envelope to yourself by registered post. When you receive the envelope it is important to remember that you should NOT OPEN it. Make sure that the date is clearly stamped and that the envelope is completely sealed. Keep the envelope in a safe place (e.g. your solicitor’s office or a bank). What if someone uses my work without permission? If you are aware of a sound recording the features a copy of your work for which no permission was sought you should contact MCPSI. Mechanical Copyright Protection Society Ireland Limited (MCPSI) is an organisation which represents thousands of composers and publishers of music. 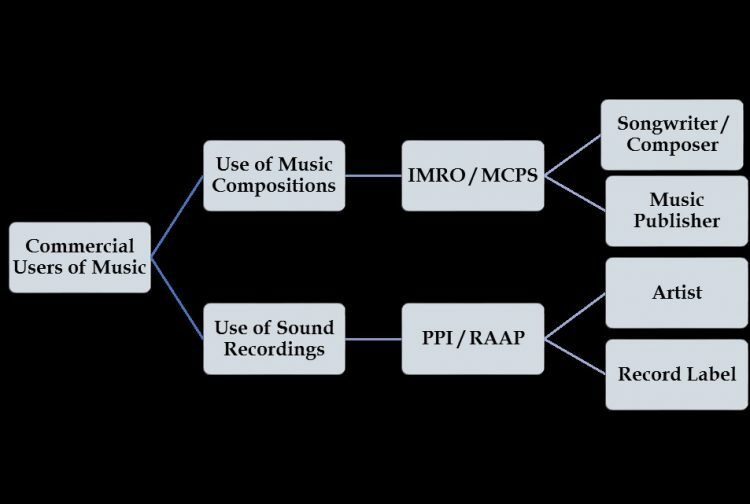 By way of agency agreement with MCPS and through their reciprocal agreements with other organisations around the world, MCPSI also represents the interests of many thousands of other music copyright owners in other countries. MCPSI licenses companies and individuals who record musical works and collects and distributes the royalties payable under those licences. This service is available to anybody who wants to recorded music including record companies, independent production companies, mobile and online companies and many others. MCPSI also licenses the importation of recordings from outside of the EU. In Ireland the copyright in a literary, dramatic, musical or artistic work expires 70 years after the death of the author, irrespective of the date on which the work is first lawfully made available to the public. How do I become a member of IMRO? That at least one of your works has been performed live in public on at least twelve occasions within the last two years. (proof required is a letter from a venue owner/manager confirming that your work(s) was performed). The idea that copyright legislation and its enforcement interferes with or undermines the freedom of citizens to enjoy fully the fruits of a nation’s artistic tradition is false. Copyright conveys certain rights on creators in order to stimulate creativity. It is only given for a limited length of time and, particularly in the area of public performance, is also limited in the circumstances under which it arises. The almost universal duration of copyright extends to the lifetime of the creator and 70 years after death. Once this period has expired, all the creative input of a particular creator ceases to attract copyright protection and the public is then free to use the material as they see fit. Such material is described as being in the ‘public domain’. Amongst the important rights granted under copyright legislation is the entitlement to prevent an adaptation of a copyright work. By virtue of this right, plagiarism, an unauthorised copying or imitation, is unlawful where the subject matter in question is copyrighted. The prohibition ceases, however, upon the expiration of the term copyright. It will be seen that it is quite normal for such material to be used by creators as basis or foundation of further creativity. The most obvious example of this is the field of opera, where pre-existing literary works, the copyright of which has long expired, are adapted with musical accompaniment resulting in the creation of an entirely new copyright work. The plays of Shakespeare have not only been used in opera but also in films, West Side Story being a good example. The works of the American composer, Stephen Foster, have been repeatedly used as a basis of new work, as indeed has the so called ‘Hillbilly’ music of the Appalachians in the southern part of the United States. That music originally emanated from England and Scotland and now forms the foundation of much of the so-called ‘Nashville sound’. In relation to traditional or folk music, almost all the great classical music masters have used this music in their compositions. Brahms, Dvorak, Beethoven, Delius and Vaughn-Williams are obvious examples where the indigenous music of a nation has been used in a new form of expression. The vast majority of countries throughout the world have signed the Berne Convention, which is the single most important international agreement relating to the protection of copyright. Article 2, para. 3 of that Convention explicitly recognises the creative merit of arrangements of works that are no longer the subject of copyright control. In doing so, it permits an entirely new copyright to be created on the basis of the arrangement. This is not to say that the original work has changed its legal nature of being free of copyright control. At all times, a work, the copyright term of which has expired, remains uncontrolled in its original state. It is only if an arrangement of that work is made, introducing new originality, that the issue of copyright arises and only then in the arrangement. In fact it is quite common for several copyright arrangements of the same work or tune to exist. Firstly, in order to qualify for copyright protection, the subject matter must be produced in some physical form. Originally, this was taken to mean in writing but now had been accepted as extending to the printed word, analogue, digital, audio and video performance. Copyright in a work does not come into existence simply by virtue of a performance. Secondly, for an arrangement of a non-copyright work to attract copyright protection it must fulfil the originality criterion. This criterion is determined in the event of a dispute by the courts by case law has indicated that a relatively low level of creative input or originality is sufficient to warrant copyright protection. In the case of Irish traditional music, no copyright issues arise when the music performed is part of a body of work that has been passed down from the time that would clearly indicate that any responsible copyright term has expired, and usually the origins of the music are anonymous. Variation and ornamentation tend to be the distinguishing features of the contemporary performance of this music. Such embellishments, however, do not create a new copyright arrangement because they exist only in the performance and not, as previously indicated, in any tangible form, such as writing or a recording. In such situations, it is presumed that artistic considerations only arise if the embellishments referred to are repeated by a third party. However, should recordings be made of such performances a right is recognised in those versions of the performance. Does registering a song with IMRO protect it from copyright infringement? Registering a song with IMRO provides addtional supporting evidence in copyright protection rather than complete protection. Please refer to the answer to “How do I copyright a piece of music”? in this section of the site for supplementary information. I’m gigging in Ireland this year. Do I need to inform IMRO? All of this information can be provided by logging into your Member Account through the Members Login link at the top of this page. This information is essential in order for us to distribute royalties arising from your live performances in Ireland. I have a residency and I will also be playing at a number of festivals. Do I need to inform IMRO? It is important to remember that residencies and festival information is also required by IMRO. So, for example, if you have a regular gig in a bar or hotel around the country please provide us with the start and end dates of your residency and the night of your residency. Please remember to also include your set list. What’s the position if another artist is performing my songs? In addition to all the information you supply to IMRO about your own gigs, IMRO is also continually surveying venues throughout Ireland to determine which works are being performed live. To supplement this information we also monitor all the National Press and all the major magazines finding out what gigs are on by established artists in established venues. Ask the artist to send in their complete set lists to IMRO or, alternatively provide the set list to you which you can then pass on to IMRO. This set list should contain all the songs the artist performs, not just your songs. If this proves to be difficult please provide IMRO with a contact number for the artist’s management or agent. What do I need to provide to IMRO if I am performing abroad? IMRO will contact the society based in that country, notifying them that any royalties that may be collected on your behalf should be sent back to IMRO as soon as possible. This is by now an established practice with IMRO and one that ensures the society abroad has as much information as possible to make a correct payment to you in the future. If you have not already done so please send into IMRO all foreign performance dates for which you have not yet received a payment. This information can now be provided online through the Members Only section of the website by following the Members Login link at the top of this page. I’m a classical/contemporary composer. What information does IMRO need from me? We need you to provide IMRO with all programme returns and dates and venues of perofrmances in which you are involved both in Ireland and abroad. IMRO licences and collects royalties wherever possible for classical and contemporary recitals in Ireland and a specific payment is calculated for each separate performance. Where IMRO has sufficient information to licence the concert it will, and if it has sufficient information on the works performed at the recital or concert it will credit you with a payment. It is in your best interest to do this: although it may appear like self-management, it will indeed stand to you if you keep all your live gigs documented and ensure that all registration forms are completed properly.You can provide us with the above necessary information online through the Members Only section of this website by following the Members Login link at the top of this page. I’m an arranger of traditional works. Should I register them with IMRO? You must register every song, tune or melody that you are writing, co-writing or that is traditionally arranged by you. If you fail to do this IMRO will be unable to identify the work as yours at the time of distributing royalties. It is extremely important that you register every song and that you do not exclude your arrangements of traditional works. 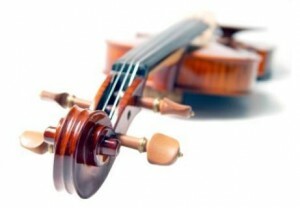 Traditional works arranged by you are afforded exactly the same standard of payment as those that you have composed. If you do not register these titles, you will lose out on royalties that should be paid to you. Please register all traditional arrangements that you are performing live or that are being broadcast on radio or TV as soon as possible. Why is it important to put writer credits on CDs? We advise all our members to ensure that every song being released on CD gives the full writer credits. In some cases CD’s are being released independently by bands in Ireland giving only the bands name as the composer information. This is not enough for IMRO’s identification of the songs. Therefore, it would be more advisable to list the writers’ names beside each track. As you will have presumably registered the work this way the work will then be identified correctly in the future. I write music for advertising commercials. How does IMRO treat these works? Whether your piece of music is a composition, or a signature tune, or background music in a film, or music to an advertising jingle it is treated in exactly the same way by IMRO. A payment is made to you for the use of this music on radio or TV. Specifically with regard to advertising jingles any writer getting involved in this side of the music business should ensure that the ad agency they are dealing with submits to radio and TV the correct music details. Usually an ad agency submits information about the product name, the music title used, the composer and the duration of the piece of music used in the advert. Please ensure with any of your dealings with ad agencies that you are 100% sure they have credited you correctly. I write music for film. What do I need to do? Copyright law does not apply to names. You do however have two possible options to help protect the name of your band. Firstly, you could register the name of the band with the Companies Registration Office and should anyone else try to register this name they will be told of your existence. You could also register your name as a trade mark or service mark and this can be done through the Patents Office. This would in effect stop anyone trading under this name in Ireland. You would also need to register this name for the rest of Europe and the World. For more comprehensive information regarding both of these processes and the associated costs involved you should contact these offices directly. On such matters it is recommended that you seek independent legal advice. Mechanical Copyright Protection Society Ireland Limited (MCPSI) is an organisation which represents thousands of composers and publishers of music. By way of agency agreement with MCPS and through their reciprocal agreements with other organisations around the world, MCPSI also represents the interests of many thousands of other music copyright owners in other countries. MCPSI licenses companies and individuals who record musical works and collects and distributes the royalties payable under those licences. This service is available to anybody who wants to recorded music including record companies, independent production companies, mobile and online companies and many others. MCPSI also licenses the importation of recordings from outside of the EU. Mechanical royalties are royalties generated from the reproduction of Musical Works. I am an IMRO member – am I automatically a member of MCPS? Membership of MCPS is separate to IMRO and not automatic. have one or more pieces of music (unpublished) released for retail purposes by a record company (other than one you own), or recorded into radio, TV, audio-visual or multimedia production and download. If both of these apply to you then membership should be considered. MCPS membership requires you to fill out the following form and also to read the attached Membership Agreement. if you have any queries relating to MCPS membership. I have some songs. How do I go about getting them to performers? As with most approaches to doing things in the Music Industry there is no standard or definitive way to going about this. However, one of the first things you should consider is which artist or performer is likely to record or perform the material that you have written. There is little point in contacting artists that have never recorded and are unlikely in the future to perform the type of music that you are trying to get out there. Once you have decided on an artist most suited to your material the best approach is usually to send a demo of your material to the artists manager, publisher or record company. Many companies do not like receiving unsolicited material so it is important for you to do some research on who is the best person to send the material to and in what form. If you have no particular artist in mind for your songs you could target specific music publishers with samples of your work. Again it is important to send your demo to publishers who are interested in your particular style of music. There is little point in sending heavy rock music samples to a publisher who specialises in traditional music. If I am in a band do all need to become IMRO members? IMRO represents songwriters, composers and music publishers. If you are in a band only those members that contribute to the songwriting process and meet IMRO’s membership requirements as outlined in the How Do I Become A Member Of IMRO section of this site are eligible to join IMRO. 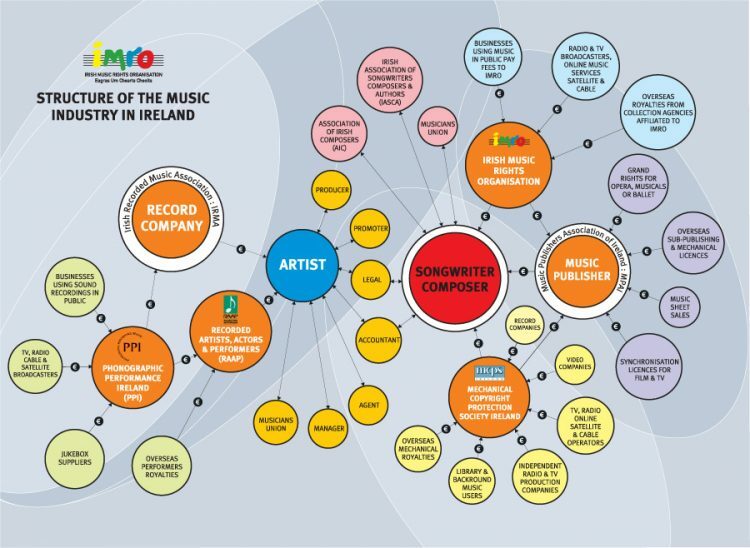 IMRO collects licence revenue from broadcasters, online music providers, venues, pubs, hotels and a wide range of business that use music and once these revenues are analysed they are paid in the form of Public Performance Royalties to the copyright owners of the works that are publicly performed. How exactly are royalties generated? For a complete and comprehensive guide to how royalties are calculated please refer to our online Members Handbook (Section C). This handbook is located in the Members section of this site. How often will I receive a royalty statement? IMRO is one of the most efficient performing rights organisations in the world in terms of the frequency of distributions it makes to its members and affiliated societies worldwide. In addition to this IMRO does not apply any administration fees to royalties earned by its members from international performances of their works. The work involved in carrying out the analysis of programmes and other data and the allocation of credits and shares is complicated and lengthy so there is an inevitable time-lag between the receipt of revenues by IMRO and their distribution as royalties. When distributions take place the member receives a detailed statement which shows the total amount earned in the distribution and a breakdown of this amount by work title, source of performance, share in the work and amount earned. Normally four major domestic distributions are made each year with royalties for Major Live Events distributed monthly, as are royalties for Live Classical performances and recitals. Royalties generated from overseas exploitations of your works are also paid on a monthly basis. How often you recieve as statement is dependent on the activity of your songs both here in Ireland and overseas. I don’t recognise a work for which I’ve received a royalty. What should I do? If a work appears on your royalty statement and you don’t hold a songwriting or publishing interest in that work please contact our Distribution Department immediately to raise a query in relation to this payment. In an effort to reduce costs and to streamline the administration process IMRO does not issue statements until an accumulated value of members’ royalty earnings reaches the accumulated threshold value of €10. At such time members will be paid the accumulated royalties in the next scheduled royalty distribution run. In the meantime members will be able to review their earnings online through a secure Members Only Area of the IMRO website. In addition IMRO has currently two payment thresholds in place: (1) Non-ROI bank accounts (threshold value- €50) and (2) for cheque payments (threshold value – €500). The existence of threshold payment values enables us to move ever closer to paperless processes and the delivery of associated cost and service benefits to members. Where does IMRO get all the information from? IMRO obtains programme details (logs of music works broadcast) from broadcasters and selected other music users licensed by IMRO. Generally speaking broadcasters are required to submit complete returns of all music used. Smaller local radio stations can, by special arrangement, submit sample returns in respect of broadcasts which have taken place using commercial recordings. They are, however, required to supply complete returns of all music which is broadcast ‘live’ from the studio or at a local outside event or specially recorded in the studio. IMRO monitors the output of all radio and television stations on a random sample basis and checks the results against the returns submitted. As far as possible IMRO distributes royalties collected from a specific live event across performance data from that event. For concerts of classical copyright music, programmes are collected for each concert and the revenue is distributed on the basis of those programmes. For other genres, the revenue from a concert is distributed on the basis of its set list. Furthermore, where a set list has been provided to IMRO, the revenue from a series of concerts by the same performer, including tours and residencies, is also distributed on the basis of this representative set list. Members and affiliates have the opportunity to provide IMRO with details of their set lists and of their tours and residencies in Ireland on a quarterly basis for the previous three months for distribution purposes. The remaining revenue from live performance pools is distributed on the basis of a number of independent surveys, notably a quarterly ‘live performance survey’ of venues where live music performances frequently take place. Royalties for most performances given by recorded means (CD or cassette players, jukeboxes, radio and television sets, background music devices etc.) 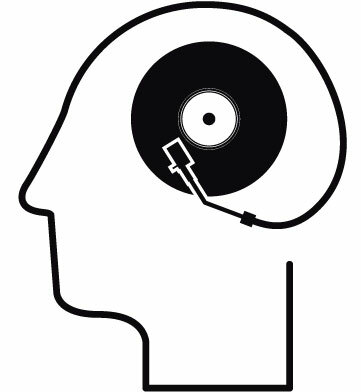 are distributed by reference to data, obtained from sources other than directly from the licensees which reflect the prevailing pattern of music use. This data includes record sales charts for both singles and albums and transmission details from both radio and TV broadcasters. Do we need to tell you if we are aware of a broadcast of our works? IMRO receives its broadcast information from broadcasters in two ways – either through full census returns or by way of sample data. In situations where your works have been performed on stations where full census information is provided you will receive royalty payments. In the case of broadcasters who submit sample broadcast returns to IMRO, only those works featured on the sample date returns will qualify for royalty payments. If you are aware of overseas broadcasts of your works please inform IMRO of this in order for us to draw this to the attention of the collection society in that territory. What is a Grand Right? This expression is generally understood to refer to performances of dramatico-musical works and ballets. – a ballet means “a choreographic work having a story, plot or abstract idea, devised or used for the purpose of interpretation by dancing and/or miming, but does not include country or folk dancing, nor tap dancing, nor precision dance sequences”. Do IMRO administer Grand Rights? The rights administered by IMRO exclude what are usually referred to as ‘grand rights’. This expression is generally understood to refer to performances of dramatico-musical works and ballets. However, the performing right in dramatico-musical works and ballets is administered by IMRO when these works are performed by means of films which were made primarily for the purpose of exhibition in cinemas (and this control extends also to television broadcasting of such films). IMRO also controls performances of these works when given in public by means of radio or television sets (for example in a hotel lounge or a public house). Television broadcasts of short ballets specially written for television up to a total duration of five minutes or of excerpts from existing ballets are also controlled by IMRO. a) Excerpts performed dramatically are always controlled by the individual copyright owner (except in the circumstances mentioned above in which IMRO would control a complete performance of such a work and, at the option of the member who is the owner of the copyright work, IMRO may administer the broadcasting right in a dramatic excerpt subject to certain conditions). b) As regards excerpts performed non-dramatically public performances of these fall within IMRO’s control provided that they do not exceed 25 minutes duration and neither cover a complete act of the work nor consist of a ‘potted’ version of it. Non-dramatic excerpts in excess of those limits are controlled by the individual copyright owners. The same rules apply to television broadcasts (except that the maximum duration of excerpts controlled by IMRO is 20 minutes), and as regards radio broadcasts, all excerpts, however performed, fall within IMRO’s control except where they exceed the same limits as apply in the case of public performances (subject however to the additional proviso that the total duration of the excerpt(s) must not exceed 25% of the total length of the work). The rights administered by IMRO also specifically exclude public performances (but not broadcasts) of music especially written for son-et-lumière productions and for dramatic productions in theatres, when performed in conjunction with such productions. In certain cases words written specially for commercial advertisements are also excluded from IMRO’s control. NB a) All non-dramatically performed excerpts which exceed the above noted durations fall outside IMRO’s control and must be licensed by the individual copyright owners. b) All ballet music – complete or in excerpt – is controlled by IMRO when not accompanied by a visual representation of ballet. c) If a dramatico-musical work (of specially written music) begins its performance life as a film, broadcast, record, tape or CD and is later adapted to the stage, IMRO does not control the stage performance of such an adaptation. However, pre-existing musical works used in films which are later adapted to the stage are normally controlled by IMRO in the first instance. How do I get royalties from a Grand Right? In order to obtain royalties from a Grand Right you need to negotiate directly with the user of your copyright works. For those who have a publishing deal this is something that a publisher will normally do on your behalf. Do IMRO provide funding for projects? Can I still be a member if I am resident overseas? The simple and short answer to this question is yes. The fact that you might be resident outside of the Republic of Ireland does not affect your ability to become a member of IMRO so as long as you fulfil the required membership requirements as outlined in the “how do I become a member of IMRO” question answered fully in this section of our website. IMRO is a registered licensing body under the Copyright and Related Rights Act 2000 (‘the Act) whose function is the collection and distribution of royalties arising from the public performance of copyright musical works within its control. IMRO began operating in 1989, and at present has approximately 11,000 songwriter, composer and music publisher members, 25,000 licensees and through its agreements with sister societies around the world represents in Ireland the copyright owners of over 14 million copyright musical works. Is it a legal requirement to hold an IMRO Dual Music Licence? Yes. If a music user, be it a radio station, a concert promoter, a shop, an employer, or any business premises, wishes to have copyright music made available (Sec 40 (1) of the Copyright and Related Rights Act 2000) to the public (‘public’ being defined in case law as anywhere outside the domestic environment), the user must obtain the permission of the copyright owner (Sec 37 of the Copyright and Related Rights Act 2000) for such public use. IMRO, as a licensing body under the Act, is in a position to grant permission in respect of the worldwide repertoire of copyright music within its control, this repertoire covering the overwhelming majority of copyright music. A piece of music is the intellectual property of its composer or author. Under the Copyright and Related Rights Act 2000 that composer or author has the exclusive right as the owner of the work to allow the use of that work by others. When you use their music in your business or workplace, this qualifies as a public performance of copyright music under the Act and you need the owners permission to do so. IMRO can give you that permission. What is meant by “public performance”? A public performance of copyright music takes place when that music is used anywhere outside of the domestic environment. Where does the money collected by IMRO go to? After a deduction for cost (approximately 18%), all royalties collected are paid directly to songwriters, composers and publishers who created the music that you are using in your business. Do I need a licence? All I use is a TV / radio! Yes you do. All TV and radio broadcasts contain copyright music, hence an IMRO Dual Music Licence is required.. Holding an IMRO Dual Music Licence is a legal requirement if you are using IMRO controlled copyright music in any business or workplace in the Republic of Ireland, including the use of music via TV’s, radios, music systems, PC’s, music in presentations, music on hold, live music, discos, karaoke, etc. Why do I need an IMRO Dual Music Licence if I already pay my TV licence? A TV licence is a certificate that states that you have paid the appropriate fee to the government and contributed to the cost of public service broadcasting in Ireland. A TV licence does not cover you for the public performance of copyright music via your TV. We’re only a small business, does this apply to us? Having an IMRO Dual Music Licence is a legal requirement for all music users, large and small. IMRO and PPI tariffs are set to take into account different sized businesses and different uses of music within those businesses. Do I need any other licence? No. The Dual Music Licence is a licence contract which covers both IMRO and PPI music copyrights. Under law, two distinct permissions are required by businesses in Ireland who play music – one which covers the public performance of the musical work on behalf of composers, songwriters and music publishers and the other which covers the public performance of sound recordings on behalf of record producers and performers. To date these licences have been administered separately by IMRO and PPI respectively. However, as of January 1st 2016, both distinct licences are now included in the Dual Music Licence which is administered by IMRO. How much does a Dual Music Licence cost? The cost of obtaining an IMRO Dual Music Licence varies from premises to premises. Click HERE to see the various premises types and relevant tariffs. Do IMRO and PPI tariffs change from year to year? Yes, all of our charges are linked to movements in the Consumer Price Index (CPI). It’s only staff that listen to the radio / watch TV in the workplace, the general public don’t have access to the business premises so why do I still have to pay for an IMRO Dual Music Licence? It is irrelevant who in your organisation has access to copyright music via the TV/radio. What is relevant is that the use of music in the workplace is in public and is considered a public performance of the copyright work, because the performance / music use is taking place outside of the domestic environment. Do I need a licence if I only watch / listen to the news? Yes you do. An IMRO Dual Music Licence is required if you use a TV or radio in public, even if you only listen to a news channel such as Sky News or BBC News. Copyright music is used during such programming, be it in the introduction/theme music to the news program, within the news program itself or be it in the advertisements broadcast on the TV or radio channel. We hardly ever turn on the TV / radio, do I still need a licence? Yes. IMRO and PPI charge on an annual basis for the use of music within their control. Taking out an IMRO Dual Music Licence gives you the legal right to use as much or as little music in a year as you wish. Do I need an IMRO licence to play classical & traditional music? In a lot of instances, yes. Music in the classical and traditional genres are often within copyright and would require permission from the copyright holder for any public performance. Copyright in musical works remains in place for 70 years after the composer’s death. Is it possible to take out a licence for just a few months? No. IMRO/PPI charges on an annual basis for the use of music within its control. I use my PC to listen to music. Do I need a licence for that? An IMRO Dual Music Licence is required for the public use of any copyright music by any mechanical means. This includes the use of music via a PC or, via access to music streaming on the internet e.g. on YouTube, Spotify, iTunes and Soundcloud, etc. The staff bring in their own radio, it doesn’t belong to the company. Under Sec 37 (2) of the Copyright and Related Rights Act 2000 ‘the copyright in a work is infringed by a person who without the licence of the copyright owner undertakes, or authorises another to undertake’, the public performance of the work. Therefore in effect by allowing staff use their own radio in the workplace, you are, as their employer, authorising the use of music on your premises and you must hold an IMRO Dual Music Licence to allow you and them to do so. The business next door has a radio, and they don’t have a licence. Why should I get one? IMRO monitors the use of its repertoire in public. An IMRO Dual Music Licence gives a music user the right to play virtually any piece of copyright music within their business. Under law, two distinct permissions are required by businesses in Ireland who play music – one which covers the public performance of the musical work on behalf of composers, songwriters and music publishers and the other which covers the public performance of sound recordings on behalf of record producers and performers. To date these licences have been administered separately by IMRO and PPI respectively. However, as of January 1st 2016, both distinct licences are now included in a Dual Music Licence administered by IMRO. I want to use music in my business, but I refuse to take out a licence. What can IMRO do to stop me? It is an offence under Sec 140 of the Copyright and Related Rights Act 2000 to infringe copyright by broadcasting, playing or performing copyright music in public without a licence to do so. The penalty on conviction is a maximum fine of €127,000 and/or imprisonment for up to five years. Commercial music can be defined as any music produced that is being marketed directly to the general public by any medium. The only exception to the above is production music. This is music specifically written for inclusion in audio and audio-visual productions and is marketed on a business to business basis. 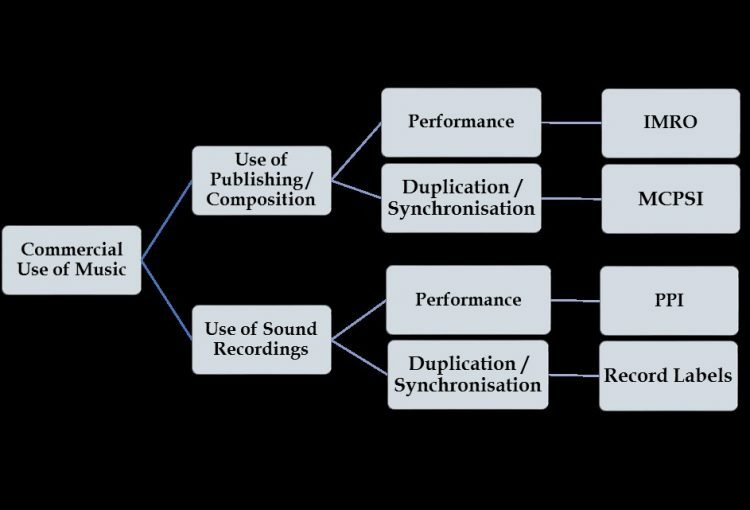 Production music can only be obtained from a production music library. 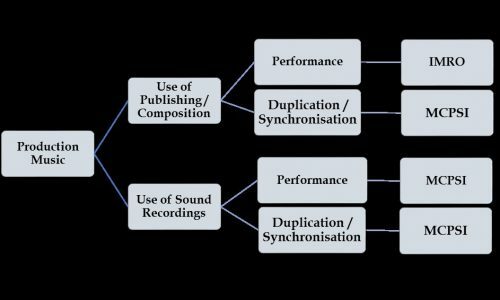 Synchronisation is the pairing of music with another form of media. For example, when a piece of music is used in a Feature Film, the music is synchronised with the film footage. The terms ‘Synchronisation right’ and Synchronisation licence’ apply to the licensing of music in this way. Common examples of ‘Sync Licensing’ include music licensed for use in TV advertising, feature films and computer games. The performing right is the right to perform a Musical Work or Sound Recording. What are ‘Sound Recordings / Master Rights’? A recording of a musical work. Usually owned by the person/company that paid for and facilitated the recording. For example: Sound recording rights for Adele’s version of Bob Dylan’s “To Make You Feel My Love” is controlled by Adele’s record company – XL Recordings. Record companies usually control sound recordings. Can I record / release someone else’s song? Without compromising the integrity of the original composition a person may release a cover version of a song once the appropriate licence has been obtained from MCPS. Any changes to lyrics or arrangements licensing, must be sought direct from the copyright holder. Can I record my own version of an Out Of Copyright Work? Yes, once it is an original arrangement.